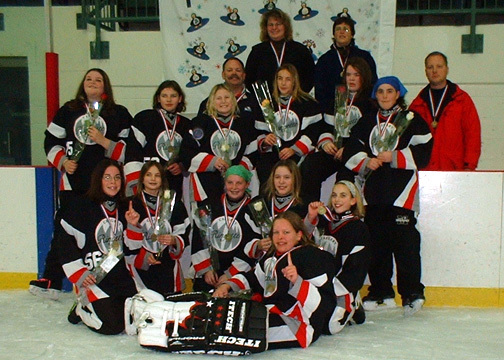 Ringette Calgary decided not to renew their contract with the Calgary Ringette Referee Association, and instead formed a new association the "Officials Committee"
in hosting the 2004 Canadian Ringette Championships. 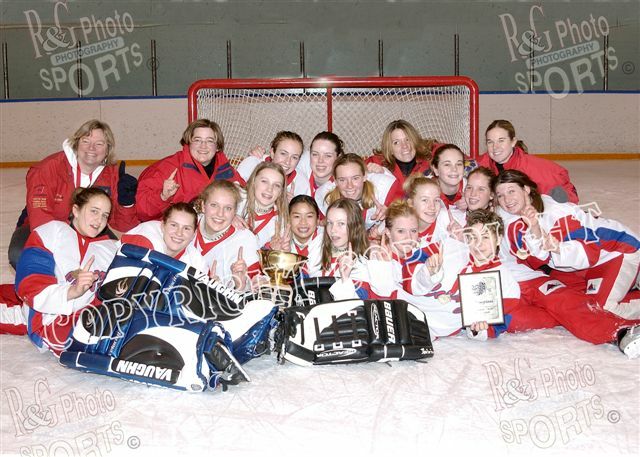 including winners, photos and more. 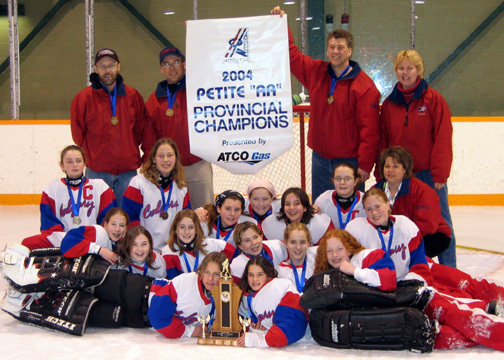 AA PROVINCIALS 2004 - All Calgary Teams Bring Home a Medal! 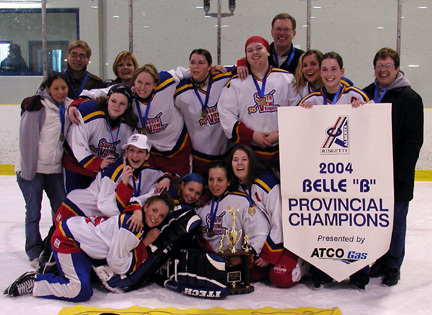 The Belles played the weekend of their lives and had to come back to beat Zone 5 Twice. 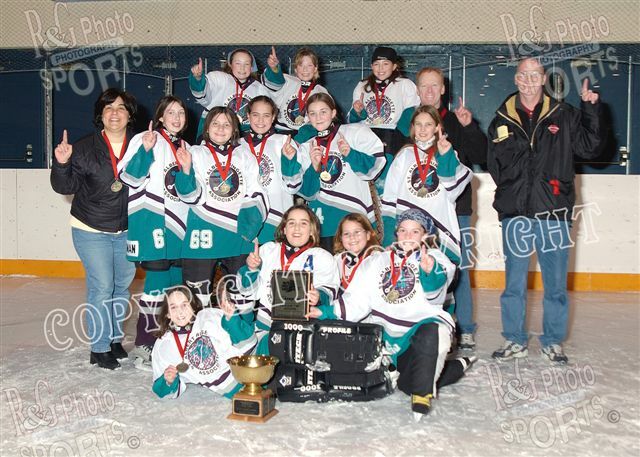 The first game was won in overtime 8 – 7, the second game they won 7-5. 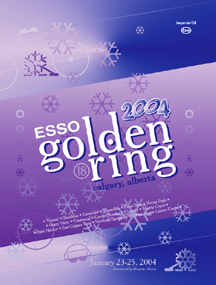 The 18th annual Esso Golden Ring was held Jan. 23-25, 2004 and hosted Bunny through Intermediate divisions. 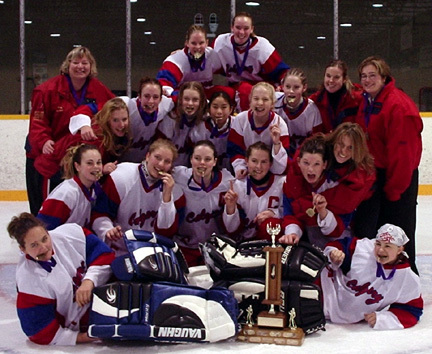 There were 163 teams in 16 different divisions. 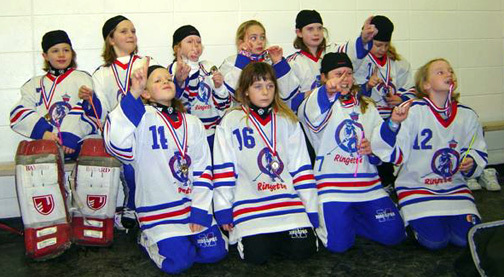 Game scores were available on our website - they were uploaded throughout the weekend using a laptop and a cell phone. 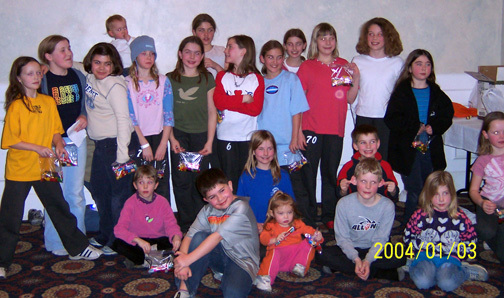 The Hospitality Night was held Friday night at Marlborough Community Hall from 5:00 to 8:00 pm. 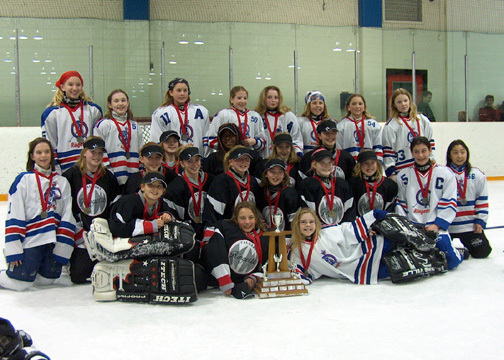 The Tween AA, Junior AA, Junior A, BelleAA, Belle A, and Open AA divisions used SHOT CLOCKS for all of their games. 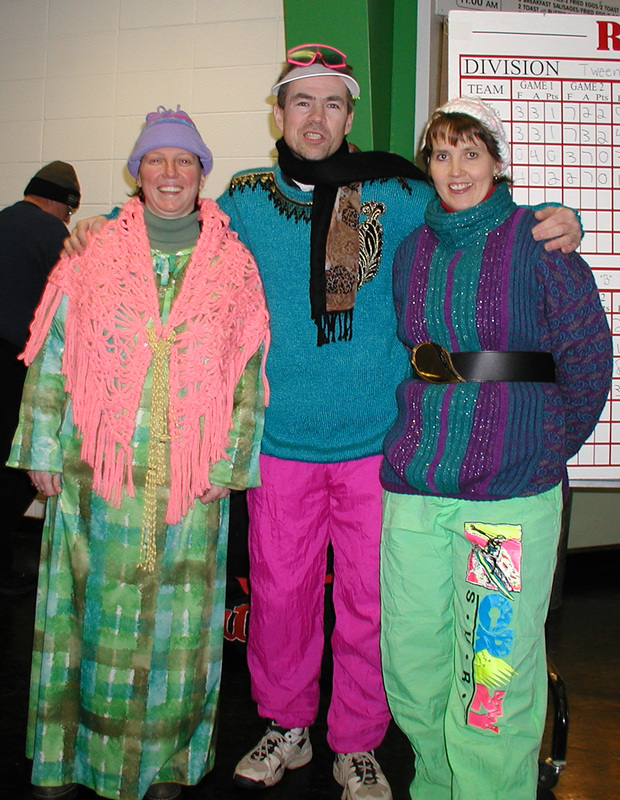 Souvenirs were on sale at Village Square Leisure Centre all weekend. 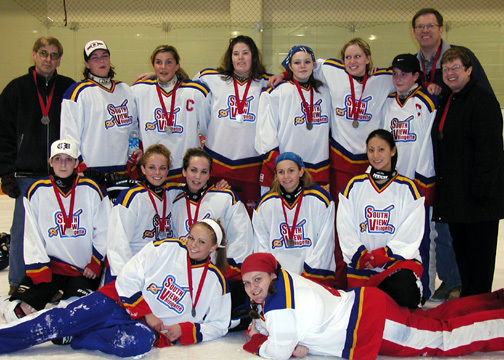 There were 2330 players on 163 teams in the 2004 Esso Golden Ring in 17 divisions of play. 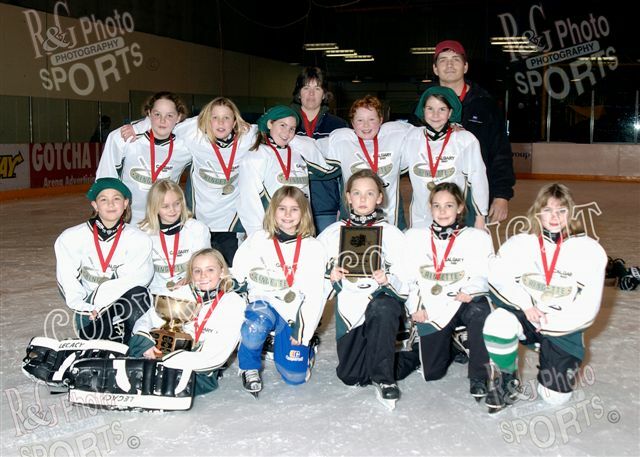 There were a total of 334 Games (455 hours of ice). 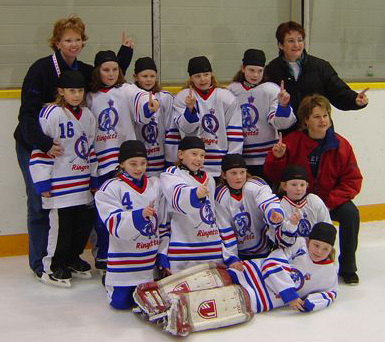 The ice bill was approximately $52,000.00. 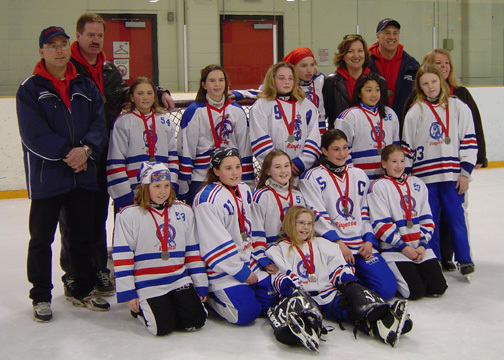 There were 65 on-ice officials used in the tournament. 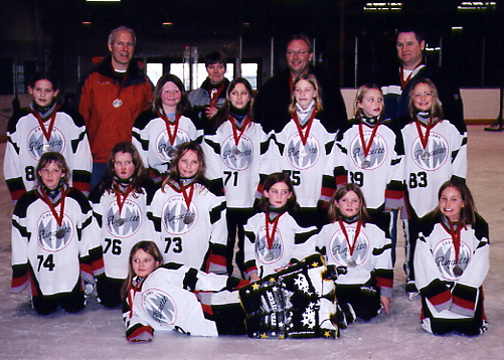 Referee game fees for the tournament total $9,973.00. The cost of "importing" referees and transporting them is an additional $4300. Hotel rooms are provided free of charge to all out of town officials. Transportation was provided to out of town officials to all of their games. 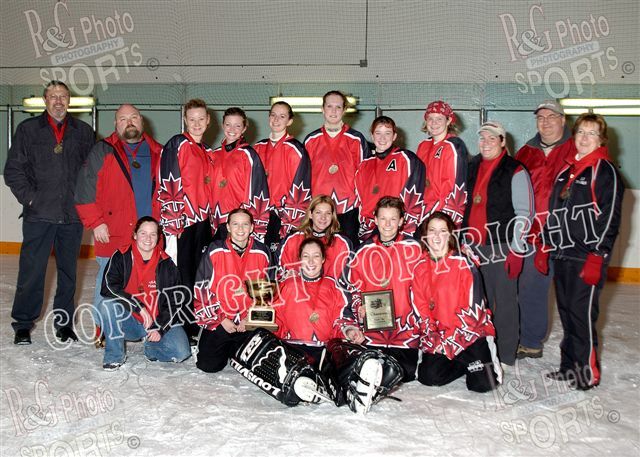 (thanks to Lonnie Krahn, Leanne Henderson, Darryl Jaques, Tony Merritt and Murray Todd who drove the refs). 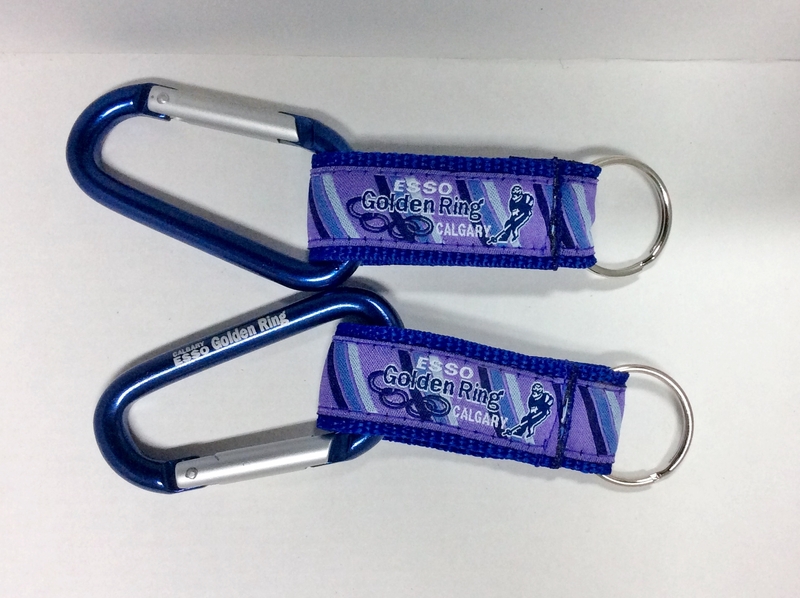 Committee members accumulated 652 draw prizes for players (4 for each team), including 200 custom stinger sticks with the 18th Esso Golden Ring imprinted on them. 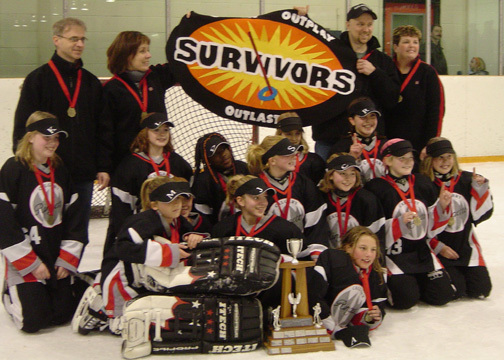 There were an additional 6580 items which will be included in coaches packs for the teams. 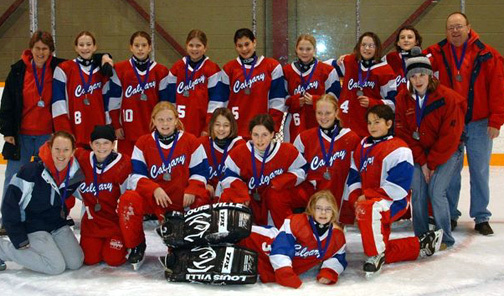 There were 240 Individuals from Calgary teams who volunteered at arenas, plus 150 people who were minor officials and shot clocks operaters at the semi and final games. 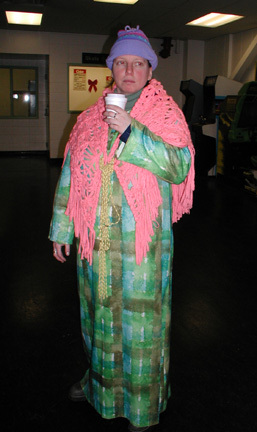 There are 22 tournament committee members, who opened arenas as early as 5:30 am, and closed as late as 12:00 am. 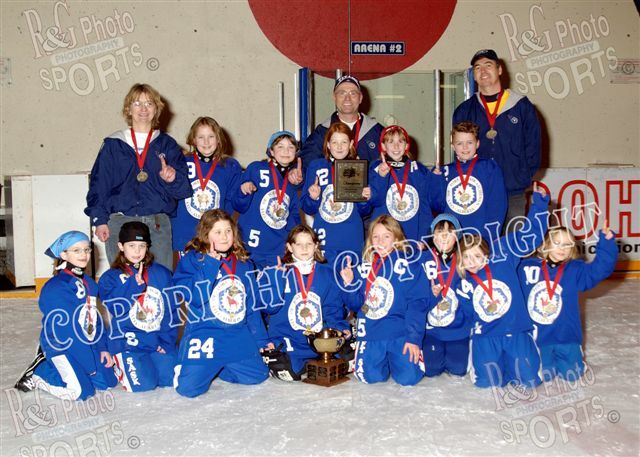 The "control centre" was once again at East Twin and was staffed with committee members and volunteers all weekend who circulated game scores, uploaded scores to the website, compiled results, and generated pre-printed gamesheets for all games. 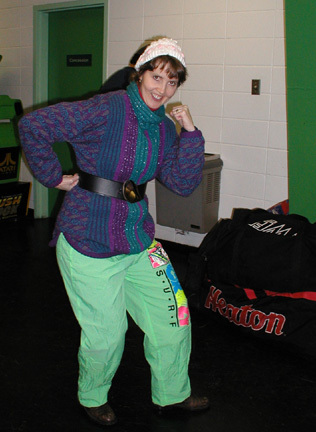 Gamesheets for each game (regardless of location) were shuttled by volunteers to East Twin arena for verification. 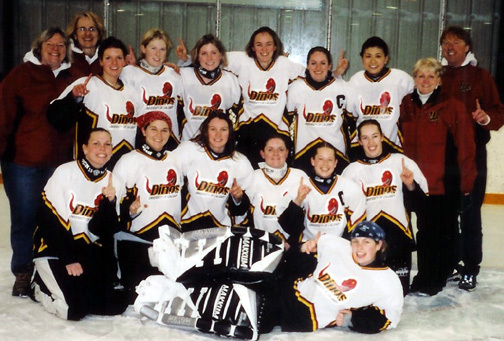 2003-2004 was the inaugural year for a Ringette team based out of the University of Calgary. 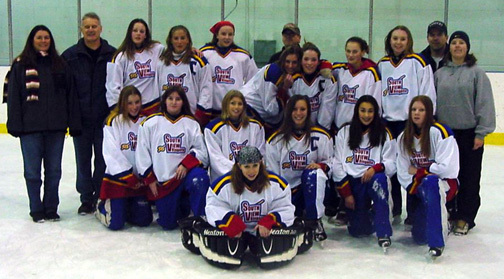 This was a significant step in the development of our sport with the hope that a intercollegiate league will not only offer our sport more publicity, but will also give post-secondary aged ringette players opportunities they have never had before. 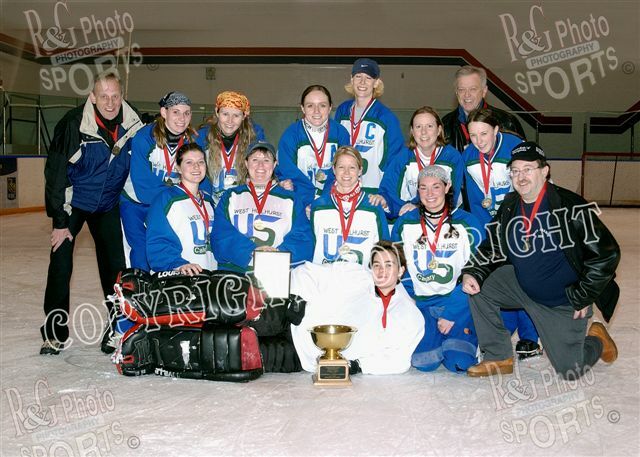 The UofC team participated in the Ringette Calgary league in the Deb/Intermediate division and was coached by Beth Veale, Bob Kerr and Bruce Hammond. Thanks to Beth for her hard work in getting this program off the ground. 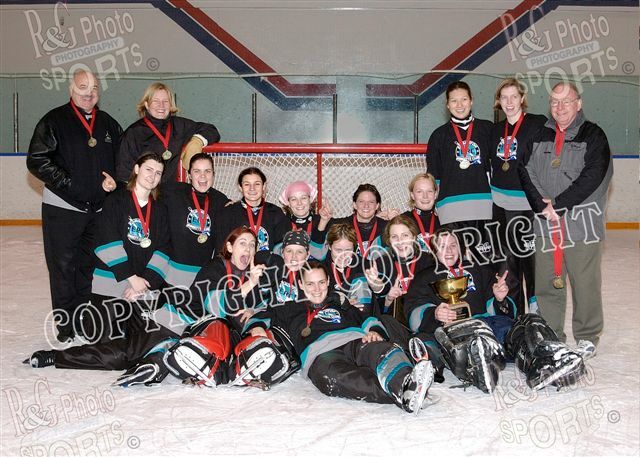 Pictured here after winning the Gold medal at the University Challenge Cup 2004 in Winnipeg. 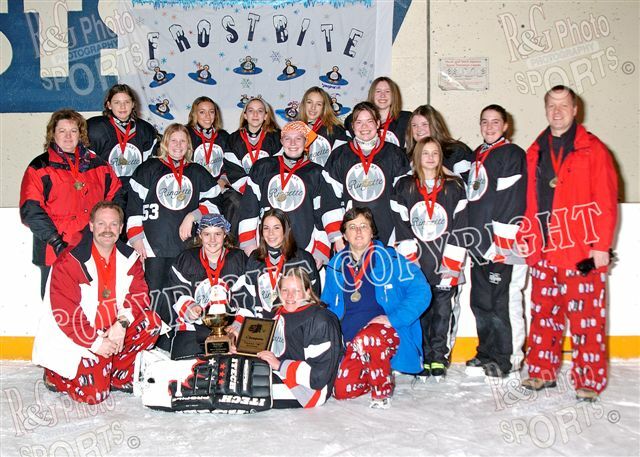 The Brian Hendricks Memorial award is given out each year by Bowview Ringette to a person who has made an exceptional contribution to the sport and our association. 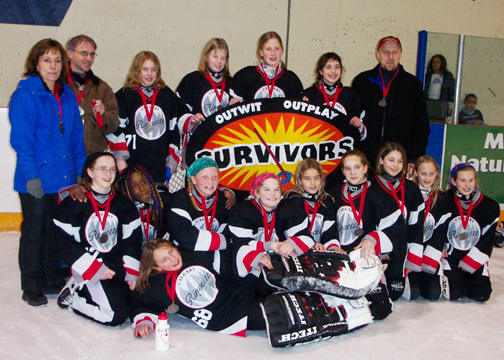 On May 19, 2004, the award was presented to Shawn Curran, who is one of the "Pioneers" of Ringette in Calgary. 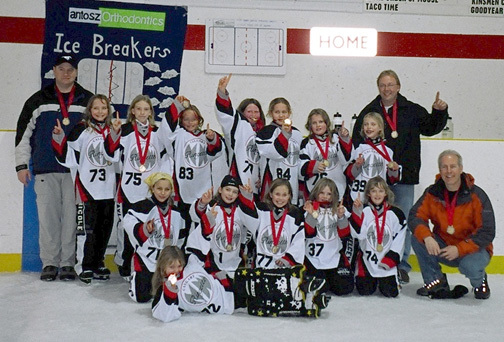 Shawn has coached and supported the sport for over 25 years, first with daughters, and now with a granddaughter. He is a tremendous ambassador and supporter of the sport. 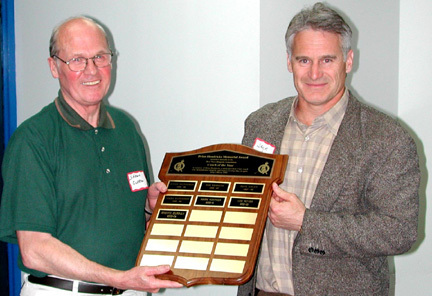 The award was presented by Jack Marsh, President of Bowview, on behalf of the Hendricks family. 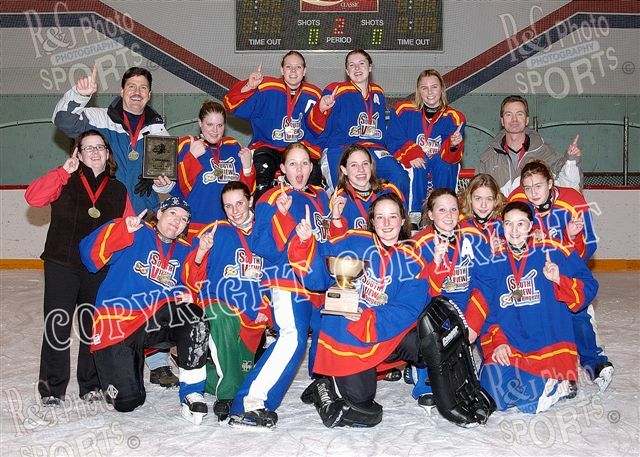 Synergy went on to win GOLD at the Alberta Winter Games February 12 - 15, 2004. 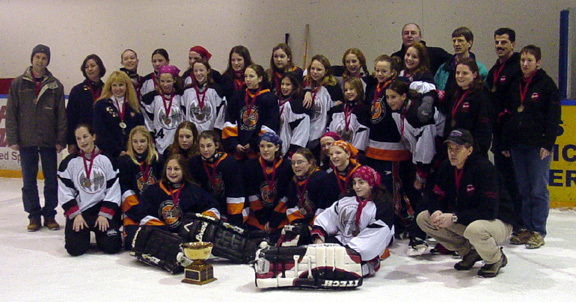 The final game was a very close contest between Synergy and Medicine Hat. 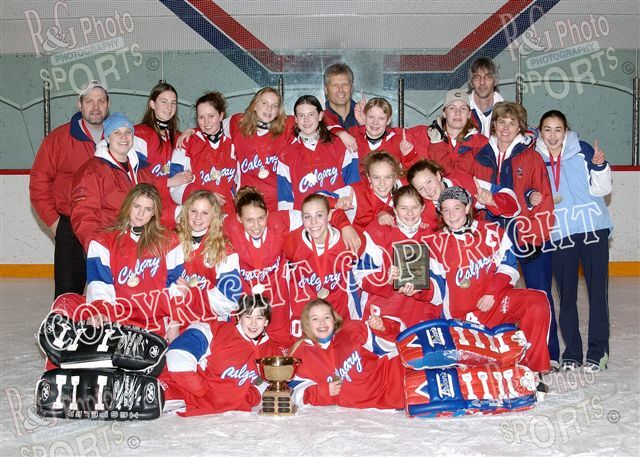 With just over 2 minutes left to play and the score tied, Synergy scored to give the Calgary team a 5 - 4 win. 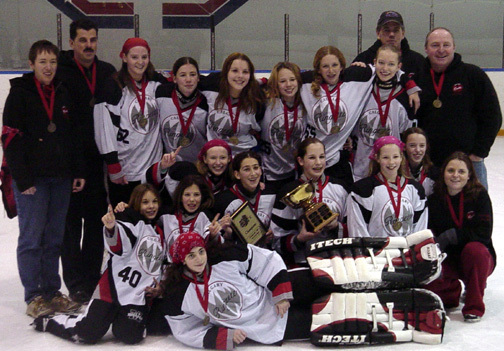 Congratulations to all of the players, coaches and team staff for a job well done. 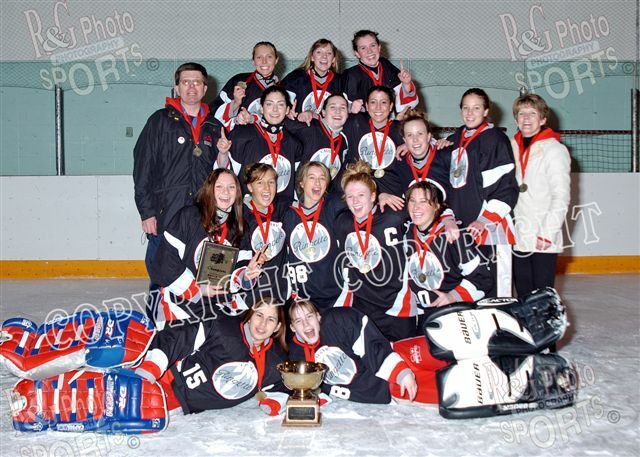 Junior B Medicine Hat Black Ice Calgary North A.K.A. 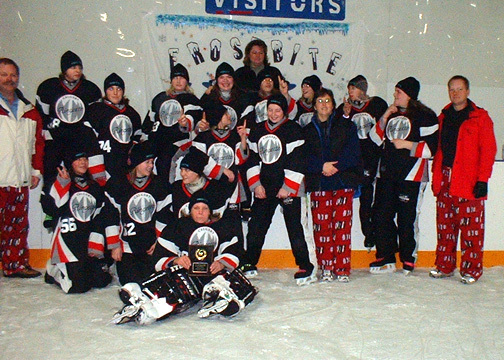 North West Impulse Tween A – Silver Medalists in Medicine Hat Tournament Hat. 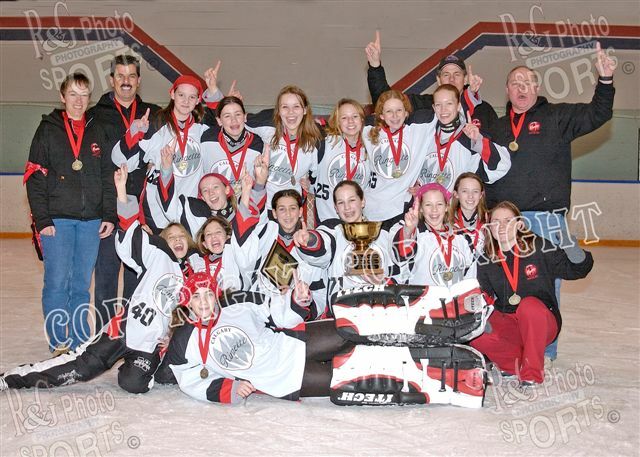 They played against Bowview, the game went to double overtime and then a shootout. 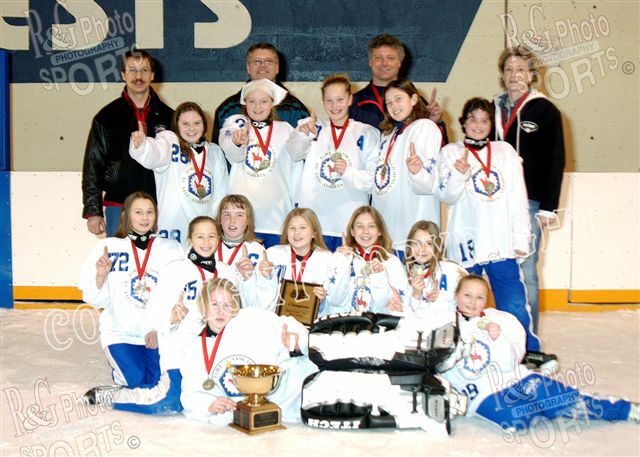 NW Ice Creamers Petite B brought home a Bronze Medal from the Red Deer Tournament.This is a photo of the girls (and some siblings) following a scavenger hunt in the hotel after the end of the tournament. 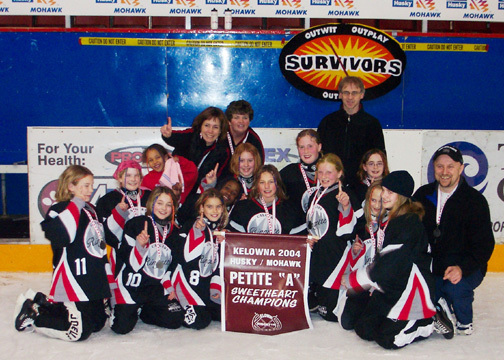 NW Petite A "Survivors" won the Silver Medal at the Esso Golden Ring and the Gold Medal at the Kelowna Sweetheart Tournament. 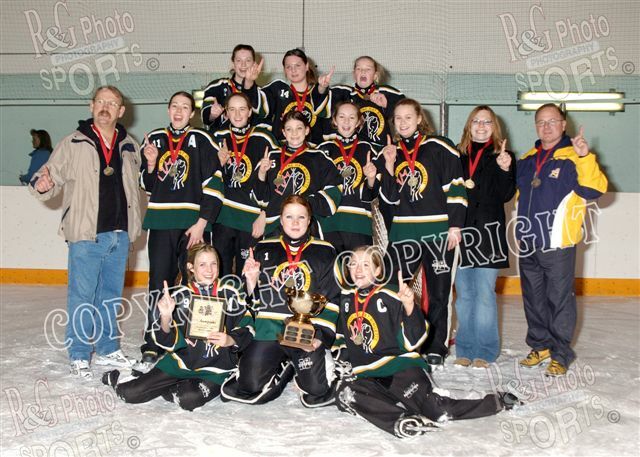 They also won Gold in the Cities against Bowview X-Treme . Congratulations to both teams for their outstanding performances and sportsmanship in making this series a thrill for all their fans!! 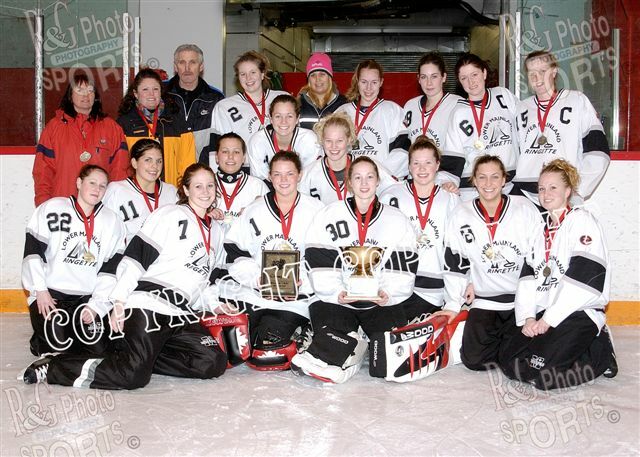 on December 5-7, going undefeated throughout the tournament. 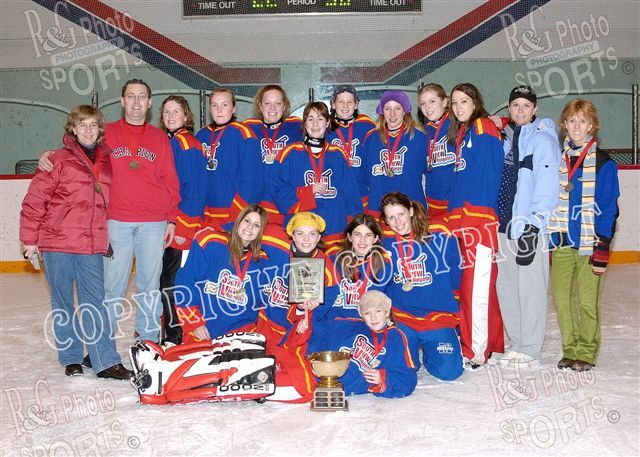 with much inspiration from their coaching staff. 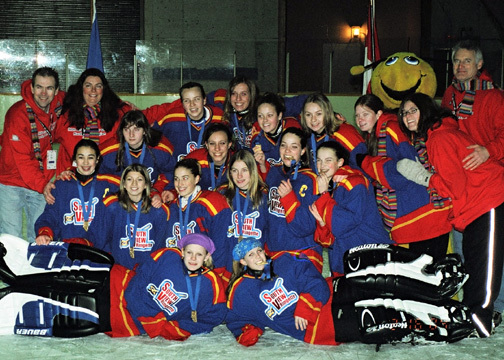 PETITE RUSH – does a line dance during medal presentations at Provincials. 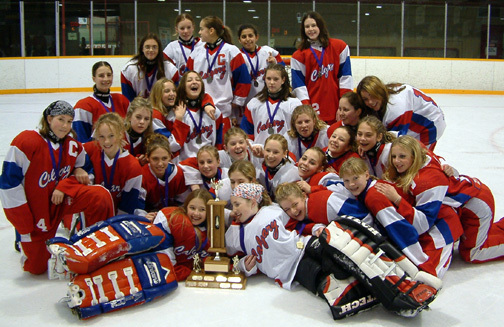 and both the Junior and Belle teams won gold in over time.